So still on the low fat and healthy food in this house, but it’s working out quite well. Last Thursday I had a pretty bad day, nothing in particular just one thing after another not quite working out, so by the time the end of the day came round I was ready to hop on a train to Manchester to see the boy rather than go home. But I went home, and well there is nothing like the smile of a 1 year old to cheer you, nothing that is except CURRY. Cooking this dish really cheered me up, and eating it got rid of any remaining blues. This is a fab dish, and I’d highly recommend it as a replacement for your take out. Apologies for the lack of photos, it smelt too good to pause and photograph. Phew that was a long list I know, but trust me, making your own curry sauce from scratch is worth it, and you can always make extra sauce to freeze, so that next time you fancy it all you have to do is add the chicken, making it a quick and easy low fat dinner. Cut the chicken into bite-sized pieces, season with black pepper and put them in a non-metallic bowl. Stir in the yoghurt, cover with cling ﬁlm and chill for 30 minutes but ideally 2–6 hours, though I know that’s not likely unless you get organised. Heat the oil in a large, non-stick saucepan, add the onions, garlic and ginger. Cover and cook over a low heat for 15 minutes until very soft and lightly coloured, check them frequently and stir every so often so they don’t stick. Once the onions have softened, stir in the crushed cardamom seeds, cumin, coriander, turmeric, chilli powder and bay leaf. Pinch oﬀ the ends of the cloves into the pan and throw away the stalks. Cook the spices with the onions for 5 minutes, stirring constantly. Stir in the ﬂour, sugar and ½ a teaspoon of salt, then slowly pour the water into the pan, stirring constantly. Bring to a gentle simmer, then cover and cook for 10 minutes, stirring occasionally to get a nice smooth sauce. Remove the pan from the heat, take out the bay leaf and blitz the onion mixture with a stick blender until it’s smooth. The sauce can now be used right away or cooled, covered and chilled until 10 minutes before serving. If you’ve made extra this is when you split it up into potions and freeze. If you had allowed the sauce to cool, bring it back up to a simmer, add the chicken and yogurt mixture to the sauce and then stir in the creme fresh. Cook this until the chicken is tender and cooked through, stirring regularly, this should take about 10minutes, but check the chicken by cutting into it before serving. Season to taste and then serve with rice and a coriander garnish. It’s a bit of a long one, but it’s worth the time and effort, this recipe is packed with flavour and even has a good deal of heat behind it. It’s a real Korma, so don’t be surprised if it doesn’t taste like the ones you get from the takeaway. A few days ago I had a very long day, so long, I was chewing dextrose tablets in an attempt to stay awake, and I’m pretty sure I was still falling asleep at my desk. So long, that the only thing I could do when I got home was watch Arthur. Ah Arthur, you funny looking aardvark, still as enjoyable now as you were 13 years ago. So once I was a little perked up I thought, what will really cheer me up? Now I recently watched Gordon Ramsey’s trip around India- where he sampled the delights of traditional Indian cuisine- making my taste buds tingle. However, at the same time, he insisted that it is impossible to get an authentic curry in the UK. I disagree. I come from a small village, half an hour away from Bradford, and my parents lived for some years in Bradford, so I like my curries. I feel that in a society where so many cultures come together, and where the concentration of one culture is so great, how can we not get that culture’s authentic food? You just have to look. Now I’m not saying there aren’t bad curry houses, The Balti House near where I live loads up their curries with cream and sugar, so much so I hate to go there, and if I do I eat vegetarian because it’s cooked for the locals. However in my area there are several great restaurants: The Aagrah, Akbar’s and The Muntaz to name a few. These are restaurants that provide excellent dishes, from specific regions, with their own special flavours that do not try to cater for a bland English pallet. 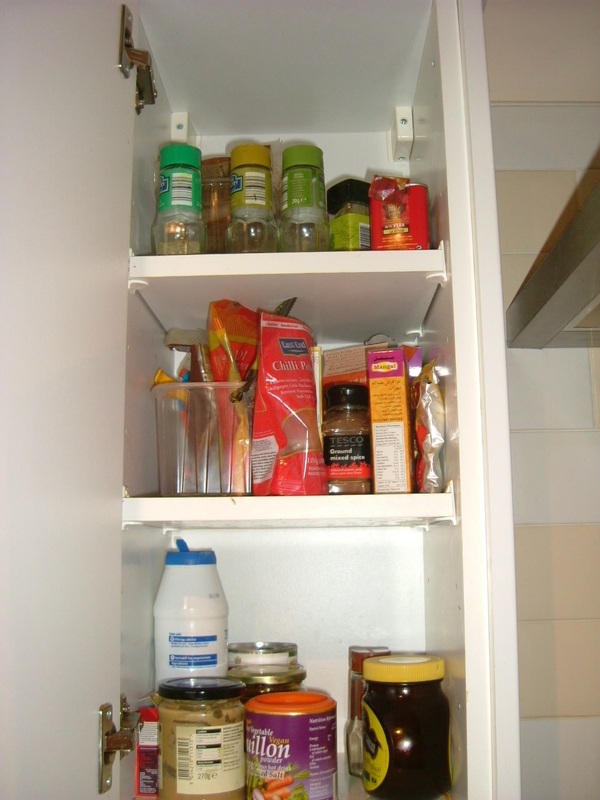 As for cooking at home, the number of Asian supermarkets has doubled, and in larger mainstream stores you will find aisles dedicated to food from other cultures. Where once curry ingredients were hard to find you can now find garam masala, coriander seed, mustard seed, turmeric, cloves, black sesame seed, cinnamon, and many packs of spices pre-combined for recipes. SO it is not impossible to cook a good curry at home – it just takes practice! Our amazing spice cupboard, yes I know Marmite isn’t a spice. So today I am going to show you my recipe for tandoori style chicken, I cannot guarantee I get all the ingredients right but I will try. Chicken on the bone – either a whole chicken or the breast with wing still attached is best (scale up amount of spice if a whole chicken). Chop the garlic and ginger into small chunks and add to a food processor with the juice of the lemon. 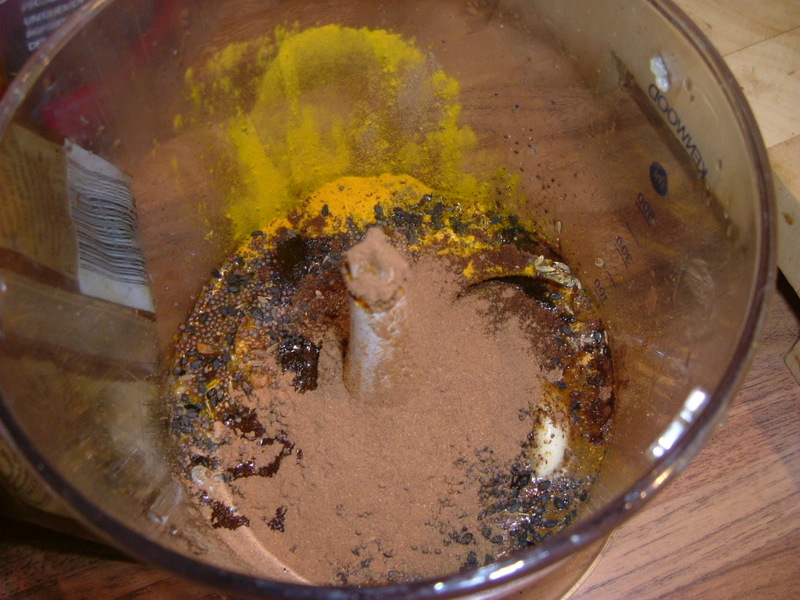 Then add the spices and blend until you have a runny paste. If its too thick add some of the oil or butter. Rub this mix all over the chicken and let it marinade it in the sauce. While marinating set the oven to 200C and wait for it to come up to heat. Once the oven is up to heat stick skewers in the chicken and rest over a deep roasting tray. Then dry roast in the oven, leave it for 30 mins, and then check every 10 mins, till the chicken is cooked and the juices no longer red. Serve with rice and/or Indian breads. The chicken should be so tender that it falls off the bone. 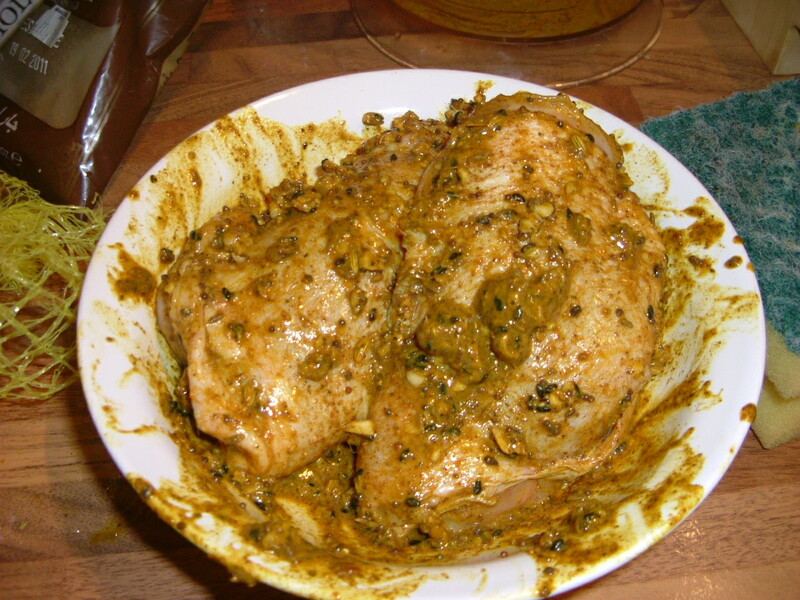 So there you have it – (hopefully) gorgeous tandoori chicken! Brief side note about lemons: I never used to add lemon to my Indian food. I’m not sure why but I didn’t, recently though I have. Lemons work so well – they have a distinct flavour, cut the spiciness of the curry and give it depth. If you haven’t used lemon in curries before I suggest you do.